(Top) Barbershop destroyed by Hurricane Katrina. (Bottom) William Muhammad cuts hair in his new barbershop. HOUSTON (FinalCall.com) - It is a hot Sunday afternoon and Supreme Kutz Barbershop is extremely crowded on a day that it is normally closed. The new school year is starting and master barber William Muhammad is giving away free haircuts to the children in the community. “It's always a good feeling to do something for the community. They have shown me so much love since I opened up the shop,” Mr. Muhammad told The Final Call as he cut one of the many heads awaiting their opportunity to sit in his chair. The shop is situated on the 7200 block of Scott St. adjacent to several housing projects, fast food spots and convenience stores in the predominately Black Third Ward area. The thing that makes this shop unique is that six years ago Mr. Muhammad and his family lost everything when Hurricane Katrina flooded the city of New Orleans—including his barbershop that was called Original Man Barbershop. “We left New Orleans the day before the storm hit and headed here to Houston. We returned to our home in October when they opened up the city back and found 10-feet of water in our home. 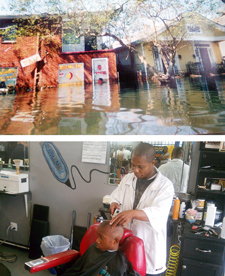 My barbershop was flooded too. We lost all we had,” said Mr. Muhammad, a father of six who has been married to his wife Cassandra for seven years. Miraculously, he said the only item that was not destroyed in their home was a framed picture that bore the images of Master Fard Muhammad, the Honorable Elijah Muhammad, and the Honorable Minister Louis Farrakhan. “When I looked at that picture, I knew then that we would be fine and that Allah was going to get us through this. In the picture, Minister Farrakhan is playing the violin so seeing their faces was music to my ears,” he said. Determined to reopen his barbershop, Mr. Muhammad scouted areas and came across his present location. After several trials, including having a business partner who backed out on him, Supreme Kutz has been fully operational for over two years. He has multiple barbers and staffers including 15-year-old Malcolm Adams who lives in the nearby Scott Plaza Apartments. Mr. Muhammad's shop also supports many community causes including the Southeast Saints Little League football squad. He's so loved in the community that when his shop was robbed his items were later returned to him. “The person who returned the clippers to me said that the people who robbed the shop wanted to give the stuff back once they found out I was a Muslim in the Nation of Islam. That's how much respect and love we have in the community. It's all love,” he said. Mr. Muhammad doesn't take for granted that he's blessed to have bounced back from Katrina and encourages others that they can do the same thing. “My wife has been the wind beneath my wings. Our relationship with Allah and the support of others has gotten us through it all. If you have a plan, go after it because God has ordained the struggle. Nothing is truly gained in life without adversity. The Holy Qur'an says after difficulty, comes ease. This wasn't easy but we've gained back everything we lost and then some,” he said.